HOW DO YOU SELL ROTC AT THE END OF A WAR? 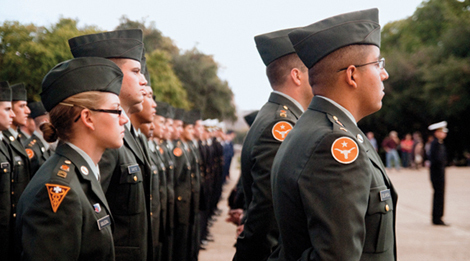 For as long as Texas has existed, kids interested in the military were told to go to A&M. The charismatic leader of UT’s Army ROTC program, Lt. Col. Kopser, wants to change UT’s image as a protest-heavy school. But can he do it at the tail end of the war in Afghanistan? I head back to my alma mater, the University of Texas at Austin, to check out its Army ROTC program and its new leader for the school’s alumni magazine.